An NSX, a Nissan Skyline, an Evo, a Silvia, a Lotus, a Porsche—these cars should be cherished and meticulously maintained. But in Hong Kong, where a parking spot can cost as much as an apartment’s rent elsewhere in the world, they’re left abandoned on roadsides and shipping containers, and stacked up high in junkyards. You won’t believe what is left out to rot. I didn’t until I saw it all myself. My brother Michael has been photographing rare, decaying cars in Hong Kong for years, so when I visited back in December of 2016, I asked him to show me some of these JDM beauties. What we found during our two-week search—covered in layers of dust, sitting on deflated tires, littered with stacks of parking tickets, and consumed by bushes—were cars that would make any enthusiast weak at the knees. In this first video, Michael and I spot a Toyota Starlet GT Turbo—a little hot hatch from the 1990s—sitting on the side of a dirt road between construction storage yards in Tai Tong, and overwhelmed with debris from the rapidly-encroaching foliage. On top of that, while bicycling near Michael’s apartment in Yuen Long, we find a closed-off yard with a number of dismantled cars sitting out front. Back behind the fence, sitting high atop of a shipping container, sits a red Lotus Esprit, whose paint has faded from exposure to Hong Kong’s piercing sun and torrential rainfalls. But of course, as Mike and I ran around filming neglected cars from sun up to sun down for two weeks straight, there’s more. Much more. In the second video, Mike and I stop by a big fishing lake, and visit a whole slew of cars littered nearby, which he’d spotted while riding on Hong Kong’s Mass Transit Railway many months prior. Mike and I visited an amazing scrapyard in Tsat Sing Kong Tsuen filled with Skylines, Integras, Silvias and a whole bunch more. If anything, it was this trip that absolutely melted my mind. To understand why so many incredible cars—cars that would be worth a pretty penny in the U.S.— were being left outside to decay, I contacted some folks familiar with the local car scene. I spoke with Victor Ma (a renowned car collector), Brian Lam (a local car enthusiast who showed me around that GT-R shop last year) and Black Cygnus Photography (a group of gearheads whose mission is to “show the world the small but vibrant car scene HK has to offer”). They told me that, for the most part, there just isn’t much love for old, non-concours-level cars in the special administrative region of China. Part of that, Black Cygnus told me, has to do with a culture that values newness and sees cars as status symbols, and part of that has to do with the fact that, in general, people who can afford cars in Hong Kong tend to be well-off enough to get new ones every couple of years. That’s because owning a car in Hong Kong is ridiculously expensive. Taxes are high, fuel is expensive, and—perhaps most importantly—parking is ungodly pricey, with Victor Ma telling me that “[a] car-park [spot] can buy a Ferrari in [the] U.S.” Indeed, just last year, a single spot sold for over $600,000. Another thing working against used car ownership in Hong Kong, Black Cygnus told me, is maintenance. Older cars in Hong Kong must pass a rigorous annual inspection, and if they fail, having them fixed can be prohibitively expensive, especially if there’s a lot of work required. Whilst Hong Kong has an abundance of petrol-heads and a thriving car scene, the system is generally car unfriendly, and for many people buying a new car before they need to do the MOT or their car is considered outmoded is the way to go. For many...buying a new one for the above reasons is the only viable thing to do. For others, car ownership is merely a pipe dream and simply not financially viable or justifiable. These contribution factors mean that cars become abandoned and forgotten with little to no chance of being restored to their former glory. Why the yards don’t want the cars isn’t clear, though the group of photographers told me that it have to do with the cheap price of steel just across the way in China making recycling rather pointless. So the only real value, then, is in parts. “The junkyards would rather turn over cars that are popular and easy to resell parts, like Corollas etc. Not that there is a big used parts market here at all,” the group said. It’s still hard to wrap my head around all of these abandoned cars. Ultimately it sounds like old vehicles tend to go unloved in Hong Kong, because of culture and high costs associated with car ownership, especially used car ownership. 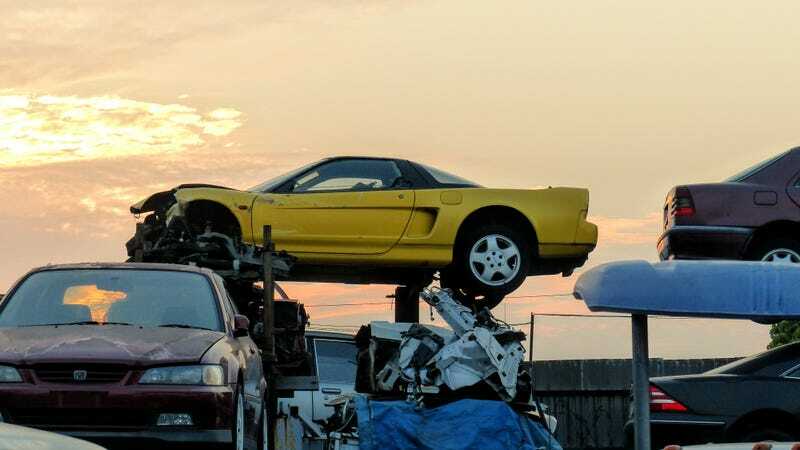 On top of that recycling yards—for whom space is a premium like it is for everyone in Hong Kong—don’t have much incentive to take in these vehicles since scrap may not be worth much, and not many folks will buy the parts, the cars end up abandoned. These are, admittedly just guesses. I’m sure many of these vehicles are just forgotten by owners who don’t have much need to drive thanks to the great public transportation system. And I’m sure a couple of the cars are indeed going to be shipped off overseas (hopefully that NSX). Each car probably has its own story to some degree, each of them fascinating and tragic and unlike anything else I’ve ever seen.